Hogan's Alley was the fifteenth game that Nintendo released for the Famicom. 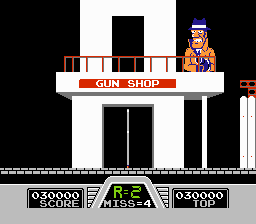 It was the third game compatible with the NES Light Gun known as the Zapper, and was a simulation of the firing practice ranges used by law enforcement agencies. In addition to two versions of a game where you must quickly decide who is a villain and must be shot, and who is an innocent person that must be spared, there is another skill game where you fire a gun at a tin can in an attempt to make it land on various ledges for points. It was released worldwide. 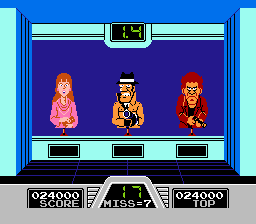 It was also released in arcades as Vs. Hogan's Alley, as part of Nintendo's Vs. arcade system, and contained two light guns so that two players could compete. 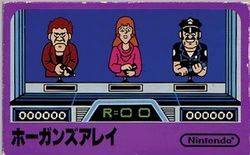 This game is meant to be played using an NES Zapper, although a normal controller is still needed to navigate the title screen. 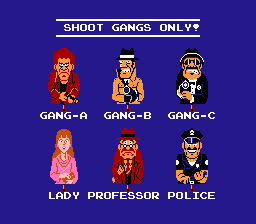 : Switches between Games A, B, and C.
NES Zapper: Selecting menu options and shooting gangsters. Game A places you in a standard shooting range. Every round, you're given a set amount of time to respond, as indicated by the number of seconds at the top of the screen. Three panels will scroll on to the screen. All three will turn to face you at the same time, and you must shoot the gangsters with the Zapper without harming any civilians. Among the three, one or two of the panels will be gangsters, never more or less. Shooting the wrong target or failing to shoot a gangster will result in a Miss. Get 10 Misses and you'll get a Game Over! Note that you can get multiple Misses per round. For example, if you shoot a civilian, you get 1 Miss for shooting the wrong target and another Miss for the gangster you've failed to shoot. This mode takes you out of the shooting range and into a realistic city simulation. You must wander across the seedy town and take down any gangsters you see with the Zapper, while you avoid harming civilians. The scoring is still the same, but the time given for you to react is less obvious. Each round takes you from a brick building to a gun shop, past a construction site and back to the brick building. Panels can appear at the windows or on balconies, and sometimes move across the streets. Shoot the wrong target or waiting to long to shoot a gangster will result in a Miss. Get 10 Misses and it's Game Over for you. As with Game A, try to get as many points as you can. Take some time off of police training and participate in this fun mode. 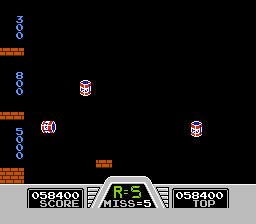 Each round, several cans will be tossed across the screen from the right, slowly falling to the left. You must shoot the cans to launch them up. Get the cans to land on the ledges at the left side of the screen to score points depending on which ledge you land on. The small ledge near the center only gives 100 points. The cans are much smaller than the panels, so accurate aiming is more important here. The cans will bounce in the opposite direction if they hit the sides of a ledge. You'll get a Miss if a can falls off the screen. The game ends when you get 10 Misses, and your goal is to score as many points as you can before that happens. This page was last edited on 29 June 2016, at 21:39.